Weave is described as ‘the story of a possessed hair extension’. While this description certainly got me interested in what was to come, the actual play was nothing like I had expected. 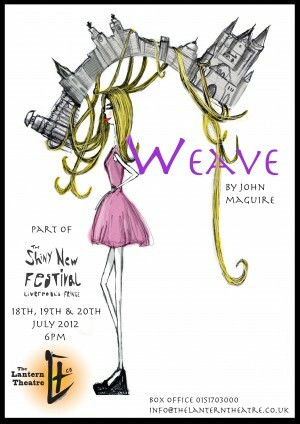 A two man show, one guy and one girl to be accurate, Weave is a comedic and often dark look at the use of hair extensions and the implications of where the products come from. The focus is on comedy for the first half, with Jennifer Bea portraying a stereotypical scouse ‘queen’ Arabella her one sided phone conversations providing most of the laughs. Walking onto stage with rollers in her hair and a Primark shopping bag hidden inside a more respectable one it reminds the local audience of the countless girls doing the exact same thing earlier in the day in town. The local jokes keep coming as her boyfriend played excellently by James Devlin strides onto stage with his hood up and hands down the front of his trackies. Whether these jokes would work elsewhere in the country is questionable, but both actors play off each other excellently in this opening scene. Following such big laughs the tone of Weave changes drastically as Jennifer takes on the role of a Russian woman who’s hair Arrabella had unwillingly bought for extensions. Her story is genuinely emotional and the contrast between the accent and demeanour of these two characters showcases how versatile she is as an actress. Questioning the audience directly in such an intimate venue makes her tale even more powerful, but as soon as we grow accustomed to this side of Weave we transition yet again into another story, one that features the possessed hair extensions. An ageing woman who pays for hair from a young girl to be noticed by the King; the message is clear but in an natural way without feeling forced. For a play based around out and out laughs for the most part, there’s a subtlety to Weave that I love It feels complete, with both actors playing each role drastically different to the last, and their portrayals are believable. An easy performance to enjoy, Weave is thought provoking in all the right ways. Tags: Shiny New Festival, Theatre. Bookmark the permalink.